I forgot to take pictures of these LO's and post them so thought I would get them posted now. 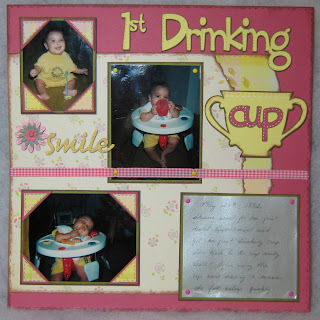 I am trying to get most of my daughters pictures done from when she was a baby. Hopefully I can find a nice scrapbook to put them in when I go to the city next month. This one is of when my daughter had her first dental appointment and they gave her a drinking cup. She took to it right away!! I just love the picture of her asleep in her walker!! I actually have quite a few like that. She still falls asleep quickly. I used Cuttin Up for the font and the cup is from Joys of the Season. I copy and pasted, flipped and welded to get the double handles on it. The patterned paper is K & Company. I used K & Company Hopscotch this one also. I am actually using a lot of K & Company for her baby pictures right now. I think they have some good colors for baby layouts. The little envie and tag came with the paper pack as did the title punchout and photo corners. Okie - super LOs - and what a cutie!! Not only am I behind with my 3 DGSs, but I haven't ever scrapped my own 3 kids!! So, you are really motivating me!! I love your layouts and your doodles on the letters. I'm now doing that--you inpsired me! thanks.